Deep in its core my brain is still processing memories of my trip to the UK. It’s piecing together the fragments of conversations, of meals, experiences, fleeing moments and promises made. Three themes are emerging – time with family and friends, gardens and food. Lots of food. Food shopping, cooking, eating in and eating out. A promise I made to myself this trip was to treat myself to a few foodie excursions. 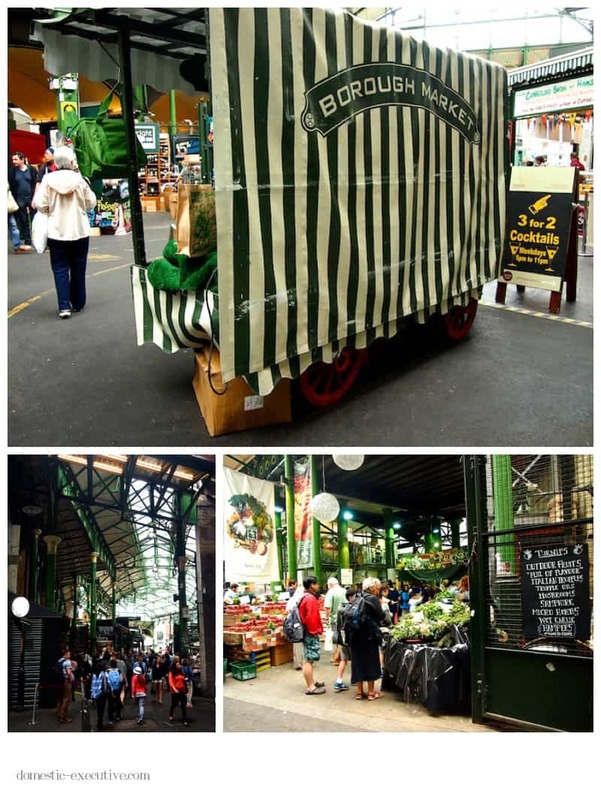 I had plans to squeeze in trips to two of London’s markets – Borough market and Maltby Street Market but as it turned out I only made it to the South Bank and the ubiquitous Borough Market. and just as I was just warming to the place my visit was suddenly cut short for a family emergency. The thing about food markets is that you can rarely capture its full glory in one go. First you conduct a full reconnaissance to scope out the scale of the place and mentally take notes of the most intriguing and most interesting products and stalls to explore. No point in getting all excited about the first cheese stall or bread seller you come across because there is likely to be more than one that you then need to compare. Before you get down to the serious business of exploring the food in-depth I find it’s always best to seek some light refreshment. That way you don’t start to behave like a ravenous hog chowing down excessive tasting portions. This break also gives you thinking time to plan your route, which produce you most want to revisit, and you can start to mentally drawing up your shopping list. Like viewing houses, the second round of a market is all about the head, not the heart. Yes those jams, pickles and oils all look delicious but do you really need to add more condiments to your already overflowing pantry. Best to keep a cool head and don’t succumb to the overwhelming feeling that you should buy just a little something from every stall holder who catches your eye or holds you in conversation about the intricacies of producing their artisanal goods. If you don’t want to behave like any other camera toting food tourist and want to indulge in some serious food photography and food writing research, I think you should offload all your parcels to your already long-suffering shopping partner. Unless you have an equally foodist companion this might be the part of the market visit you conduct by yourself as you can never capture the true spirit of the place nor find the most interesting perspectives to write about when you are under the pressure of a watchful eye or earshot of those exasperated sighs. I was seriously impressed with what I saw at Borough Market, the range and quality of the produce I tasted was pretty amazing. Going on a weekday saved us from the worst of the tourist crushes that flood to the market on a weekend. The only complaint I have about my whole trip is that somehow I missed out on eating some of what we bought. 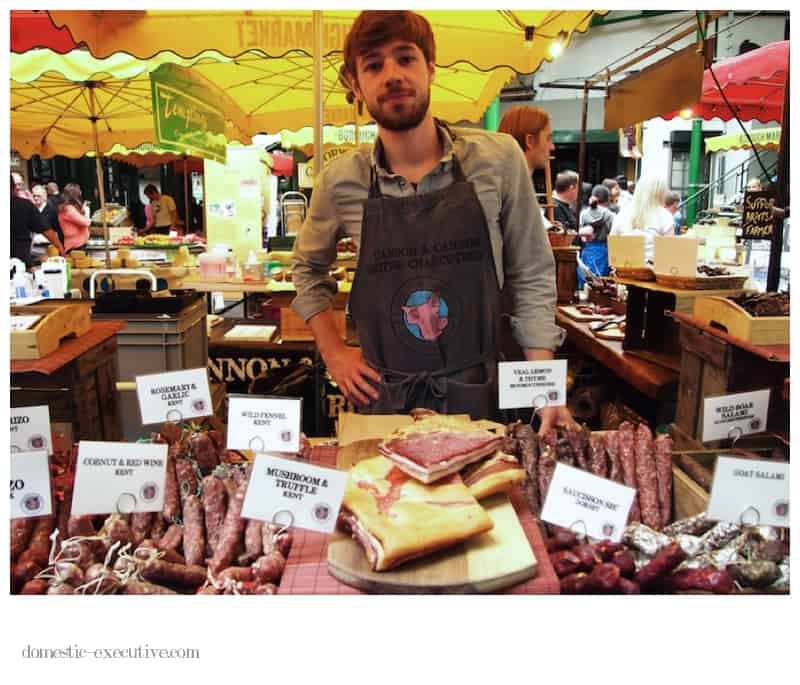 It’s a long story but the chap in the last photography below sold us some impressive charcuterie including goat salami that I shall have to just dream about until I can get back next time and buy some more. Seems my nephews, sister and brother-in-law enjoyed it though which is scant constellation. 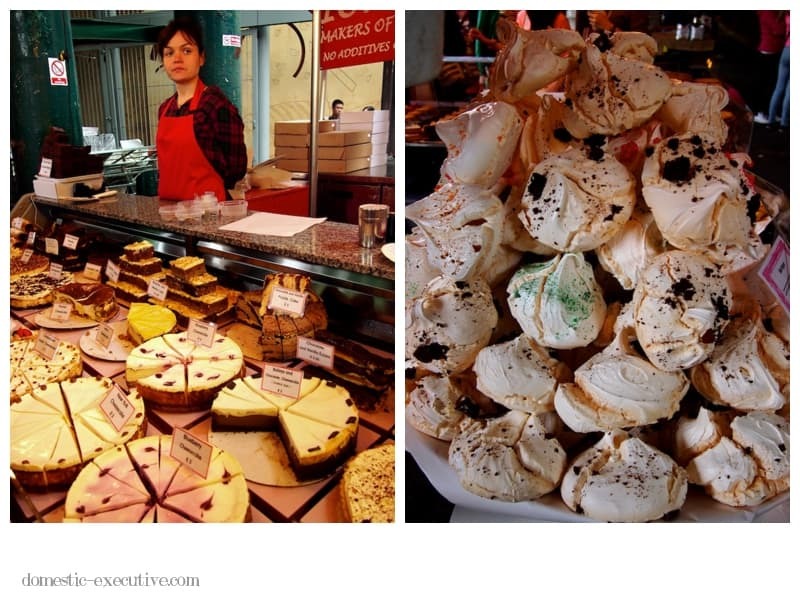 Next time I am in the UK I aim to be back at the market to do a full food blogging assignment as I have since found out that a former colleague of mine is a volunteer trustee so I am counting on the inside track and fully exploiting the rule in life that it’s not what you know, but……..! In the meantime, here’s a few photos from my tourist toting mode. I’m very envious. Whenever I head to any overseas destination, the first place I always head to is the market, and I pretty much scope it out in the same way you do. The market in Barcelona is without doubt the best market I have ever been to so far, but the Burrough Market is definitely on my list if I ever get to London again. 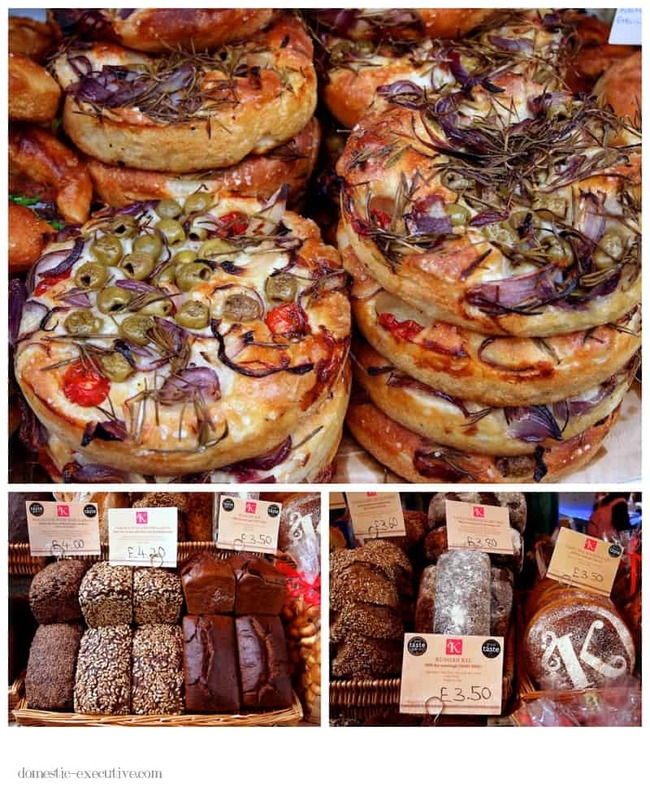 Oh I loved the Borough Market & yes you totally need someone to carry all the goodies while you take all the photos! You make me want to go back, though who wouldn’t for those wonderful long sunny summery days they are having?? We definitely picked a good summer to head home! And now you 2 have also made me want to go back to Spain! That market in Barcelona is amazing!! And good to hear family crisis all ok!